*The Kansas City Jazz Orchestra’s performance of Mary Lou Williams’ “Zodiac Suite” was previewed by Libby Hanssen for KCUR. *Joe Dimino interviewed Dan Thomas and two of his UMKC students. *The Kansas City Star reports that the Grille at Park Place, a Johnson County restaurant that hosted jazz performances every weekend, is closing. 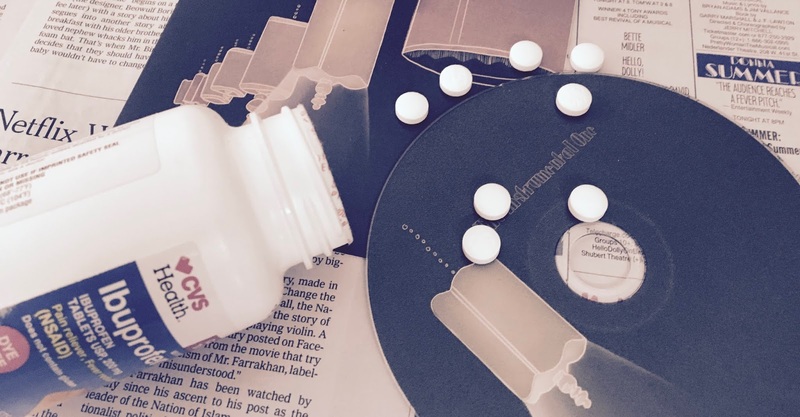 *Julie Denesha examined a Charlie Parker-inspired art installation for KCUR. Kansas City’s top entertainer oversaw a jubilant tribute to Kansas City’s most famous son at the Gem Theater on Sunday. 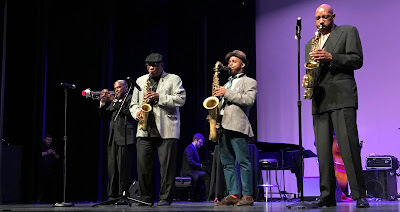 In many ways, Lonnie McFadden’s "Charlie Parker: Past, Present & Future" presentation was a McFadden Brothers concert with an extra helping of chatter and contributions from two auspicious guests. Most members of the audience of more than 400 wouldn’t have had it any other way at the momentous event. McFadden, the man known as “Mr. Kansas City,” is a jazz saxophonist, tap dancer and Las Vegas-style showman. He was joined by his brother, trumpeter Ronnie McFadden, and a core band of pianist Andrew Ouellette, guitarist Matt Hopper, bassist DeAndre Manning and drummer Tyree Johnson. The 100-minute show featured appearances by Kansas City’s grand master Bobby Watson and the New York based saxophonist Tivon Pennicott. 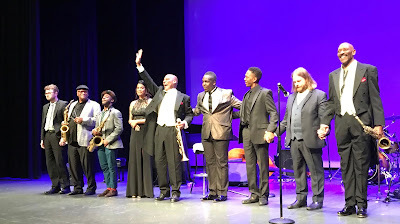 McFadden insisted that he’s a dedicated Parker scholar in a lengthy appreciation at the start of the culmination of the fifth annual Charlie Parker Celebration. He may have felt the extended commentary was necessary because the show didn’t feature a single Parker composition or any attempts to recreate Parker’s sound. If McFadden’s verbal acclamations represented the “past” portion of the show’s title, the vital music defined the “present.” The McFaddens stepped aside to allow Pennicott to showcase his imposing technique on “Lush Life” and his original “Never Been.” Watson sounded as magnificent as ever on his compositions “Sweet Dreams” and “Wheel Within a Wheel.” McFadden’s duet with his daughter Chloe on “Unforgettable” and a tap dance routine with Ronnie were sure-fire audience pleasers. McFadden insisted that the “future” component of the show’s title was represented by the comparatively young musicians Hopper, Johnson, Manning and Ouellette. While they played flawlessly, none of them has yet revealed an intention to become a transgressive innovator in the tradition of Parker. Area jazz fans will need to wait for Logan Richardson’s return to Kansas City on September 8 to hear a truer representation of Parker’s futuristic vision. Mike Dillon, the percussion maniac who has entertained (and terrorized) Kansas City audiences for decades, returns to the Brick on Wednesday, August 29, with Nolatet. Joined by pianist Brian Haas, bassist James Singleton and drummer Johnny Vidacovich, Dillon will perform material from the band’s bracing new album No Revenge Necessary. The show is one of scores listed at The Kansas City Jazz Calendar. *Larry Kopitnik examines the Charlie Parker Celebration for The Pitch. *Ron Carlson’s For You was recently released. *David Basse touts the Charlie Parker Celebration in University News. *Jacob Wagner and Chris Burnett discussed Charlie Parker with Steve Kraske on KCUR’s Up to Date. *Chris Burnett was interviewed by Joe Dimino. *Lonnie McFadden’s “Charlie Parker: Past, Present & Future” concert at the Gem Theater was previewed by The Kansas City Star. *Mark Lewis, a saxophonist and flutist based in Seattle, will perform with Bram Wijnands at the Majestic on Friday, August 24, and Saturday, August 25. Nate Nall travels directly to the hard bop territory currently occupied by the likes of his fellow trumpeters Sean Jones and Terell Stafford on the opening track of Places to Go, his debut album as a leader. For the next 50 minutes, Nall, a product of Bobby Watson’s jazz program at UMKC, confidently plants a flag in a destination that almost certainly meets with Watson’s approval. Even though they only venture beyond the familiar terrain to take in the rugged vistas of “Destination Unknown” and the craggy canyons of “Starry Night,” Nall and saxophonist Matt Baldwin, guitarist Adam Schlozman, bassist Sam Copeland and drummer Zach Morrow capture plenty of dazzling auditory snapshots. A trio led by Charlie Hunter will perform at the Bottleneck on Tuesday, August 21. The guitarist isn’t as esteemed in the jazz community as the so-called “big three” of Bill Frisell, Pat Metheny and John Scofield, but his playing may be no less influential. Hunter’s appearance is one of countless gigs listed at The Kansas City Jazz Calendar. 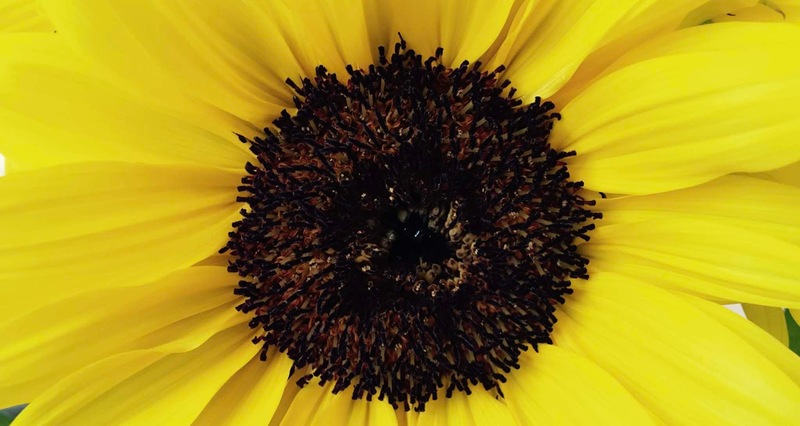 *Karrin Allyson’s new album Some of That Sunshine was released last week. *Lonnie McFadden was interviewed by Joe Dimino. *“Herman Mahari” and “Mark Lowery” are among the musicians nominated in The Pitch’s “The Best of Kansas City 2018” poll. *The playlist Nate Chinen created to promote his new book Playing Changes: Jazz for the New Century includes two tracks by artists with Kansas City roots. Logan Richardson’s “Anthem (To Human Justice)” and the Pat Metheny Group’s “The Way Up: Part Two” are represented. The annual Charlie Parker Celebration begins this week. 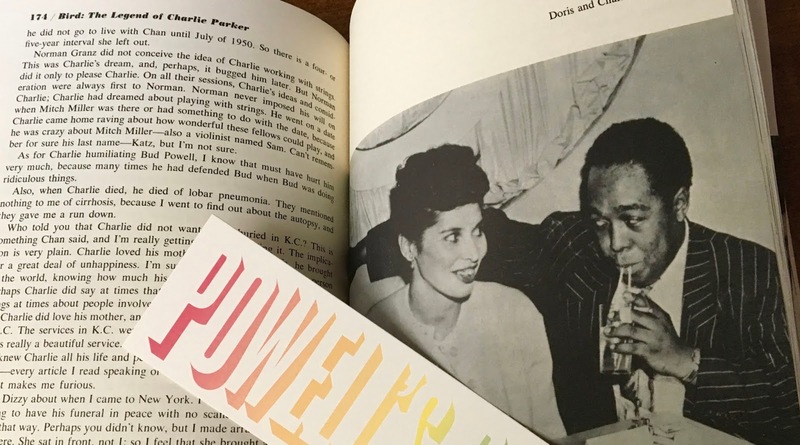 The initiative of a handful of altruistic civic boosters may lack the star power and crowd sizes associated with New York City’s Charlie Parker Jazz Festival, but the ambitious endeavor merits the support of anyone with even a passing interest in one of Kansas City’s most important sons. 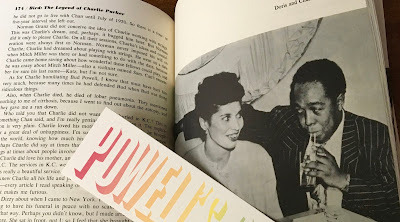 I’ve highlighted five particularly promising Charlie Parker Celebration events to provide a sense of the scope of the offerings. People who enjoy talking about Parker more than actually listening to his music will be at home at this forum. David Basse will be joined by musicians including artists-in-residence Lonnie McFadden and Tivon Pennicott at a lovely picnic-oriented setting deep in the heart of suburban Johnson County. The West Bottoms setting is ideal for anyone seeking an ostensibly “authentic” evocation of the atmosphere at a Kansas City jazz club 70 years ago. Anyone with an ounce of civic pride should take this tour at least once. Plastic Sax documented the trek in 2014. Bobby Watson and Pennicott are among the musicians featured in the signature concert of the Charlie Parker Celebration. The annual Charlie Parker Celebration begins in the Kansas City area next week. As in past years, the bold New York based saxophonist Tivon Pennicott is an artist-in-residence. Details are available at the event’s site. All of the area’s jazz performances are listed at The Kansas City Jazz Calendar. *A blogger reports that more than 5,000 people attended a R&B oldies concert in the Jazz District on Saturday on the same site that struggled to draw 500 people for jazz notables like Chick Corea at the American Jazz Museum’s ill-fated Kansas City Jazz & Heritage Festival last year. *One of Pat Metheny’s appearances at the Newport Jazz Festival elicited an ecstatic review from a critic for Rolling Stone. Ahmad Jamal’s 1968 album Tranquility is loaded with nebulous soul-jazz grooves. The Myers Swingset’s congruent The Instrumental One could be have been titled Wooziness. The subdued set recorded at Green Lady Lounge resembles the soundtrack of an alcohol-abetted dream about an unhinged evening of bar-hopping at area jazz clubs. The playing of Jackie Myers, the keyboardist who leads the hazy session that features guitarist Danny Embrey, bassist Eddie Criswell and drummer Daniel Hogans, often sounds as if Jamal had been consigned to a permanent residency in an opium den. The Instrumental One isn’t the year’s best Kansas City jazz album, but it’s likely to be the strangest. Anyone seeking a respite from the summer doldrums or in need of a jolt of undiluted joy need only hit the Riot Room on Tuesday, Aug. 7. The Virginia based No BS! Brass Band blends the jazz-rooted sound of New Orleans brass bands with Washington D.C.-style go-go funk. More than a dozen additional options on Tuesday are listed at The Kansas City Jazz Calendar. *The 2019-19 season of the Topeka Jazz Concert Series has been unveiled. The roster of locally based and touring acts includes Stan Kessler and Katie Thiroux. *CityScene KC reports that YJ’s Snack Bar, an establishment that’s long hosted weekly jazz performances, will soon reopen at 1746 Washington. *The Count Basie Orchestra’s All About That Basie will be released on September 7. The album includes guest appearances by Stevie Wonder, Kurt Elling and Take 6. *Tweet o’ the Week: 18VineKC- Join us this First Friday for “A Yardbird Homecoming” exhibit: A Yardbird Homecoming featuring the life of the little kid Charlie Parker, his hard times, his friends, his revolutionary jazz music and the exhibition of the complete Dial Record Collection (Jazz to Classical).